S7 Airlines, a member of the oneworld® global aviation alliance®, opened sale of air tickets at special fares for flights from the cities of the Far East and Siberia. 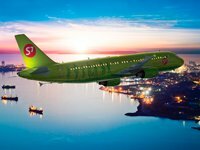 S7 Airlines reduced fare tickets are offered as a part of the state programme designed to provide the availability of passenger air transportation from the Far East to the European part of the country and backwards. Special fares are available from the 1st of April till the 31st of October 2014. During this year S7 Airlines will perform flights at special fares1 in economy class cabins on six routes: Yakutsk — Moscow, Ulan-Ude — Moscow, Chita — Moscow, Norilsk — Moscow, Gorno-Altaysk — Moscow, Vladivostok — Petropavlovsk-Kamchatsky and backwards. On every such flight from 40 to 60 seats will be provided for passengers with reduced fare tickets. Reduced fare tickets can be booked only at the own sales offices of the airline or agents. You can get detailed information by calling S7 Airlines contact centre on (free within Russia). Taxes and charges are not levied. 2 Reduced fare tickets are also available for persons, who accompany Disability Group 1 persons or disabled children.